Articulated arm for magnifying glass, camera, microscope? That linkage has never worked for me, aft hits always something and height and positon adjustment interact. I would have bought light/economical version, but could not find one. I checked TV-table/wall stands, but nah. Maybe it is not too hard to make one? I found this thread, Stevensons articulated taping arm. That looks like a good canditate, scaled down a little and maybe one more pivot added, because I want to pivot and pan the glass. Just one thing caught my eye. On this microscope stand they seem to have one thick upper arm, which I suspect still is a parallel arm design. Started to draw one and realized that I could design it such a way that upper arm would be in tension, thin one inside the main arm would then do and there still would be space for a gas strut. 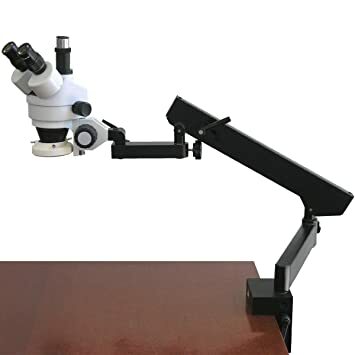 Re: Articulated arm for magnifying glass, camera, microscope? More joints would mean less wasted space on the back, but each joint will add weight and play. Compromise. Have to choose between three and four for lateral movements. Height adjustment arm will need four, but they should be loaded = play is eliminated. The more joints You add, the better it looks. And yes, feature creep .. I made a quick mock up of the lateral joints. Wood, screw, washers and now I know how many joints I need. I checked the rest of the magnifying lamp: all joits are loose and the parallel arm structure is not at very good shape anymore. Have to deside if I'll try to mod it or replace it. While this may be too far off what you had in mind or what you want but... products like Loc-Line can be used for mounting lights and magnifying glasses and then there are Ram mounts although the Rams aren't too conducive too frequent adjustments. Actually I was concidering short piede of that kind of "joints", although I really just need one ball joint or a compas joint type thingy. I agree that for one setting that sort of solutuon is more elegant that arms and takes less space too. Rest of the stuff pretty much should be one axis joints to allow fast and repeatable X-Y movements. Tried to find inside out model of the parallelogram linkage, but I'm not finding he right catchphrase for that one. Bit more testing, now with gas strut and parallel arm linkage. Car parts store didn't have small eneough gas struts, 500 mm between pins, OD18 mm, and 350N of nominal force. It did work, but I was counting gas srut to deliver no more than max. force and frictions to take up something like 30%. BS. Got too much force. It would work fine with taping machine....need something smaller. I made this in couple of hours and did not pay very much attention to accuracy, It is ok, but linkage is somewhat sensitive and needs carefull construction. Better to get all holes straight and on right places. Search for Pantagraph arm . The simple parallel linkage has no design challenges unlike those "stedi cam" contraptions. Much on those design seem to revolve around basic parallel arm linkage designs. Basically my desgin problem now very mundae: Finding the gas strut that is small enough in size and capacity. If the gas strut is too strong, something like 400N then the linkage ratio comes large....not ideal. If the gas strut is too large I have to mount it outside, making it bulky or if I reduce other parts, then bearing points are further together and that means more accuracy is needed and pin load is higher. All more engineering and manufacuting challenge. I'll get one more bar of thin walled pipe and try out another arrangement. Why not make one end of the gas-ram mount adjustable ? If it pivoted at the fixed end somewhere between the two arms it would reduce the force at the end of the arm . Perhaps a U section gas-ram pivot could be made to slide inside the fixed vertical part? If the top arm was a an inverted U section the gas-ram would fit inside as it folded. Haa, Very much the idea I have been playing with...I placed some parts on underarm, but effectively the same thing. And even more of a coincidence I got a U-trough cable quard for upper arm, I was going to use it with matching 25 mm square pipe, but run into a little snag - the smaller gas strut (150N), is fairly perfect to float the 970g lamp, but with only with a narrow margin. Could change the lever ratio thoug. Welcome to the club Peka that sort of thing drove me round the bend last year for an entirely different product that needed one touch solid lockup. Bolts and screws through the arms will wear, bare in mind detectable play means a lot at other end. One thing noticed looks like only have around 30 degrees movement either way in one plane, increase the pivot centres so can get a full 90 degrees swing and a lot more movement. Have had some bearings last two months for a mark 4 1/2 design. Never took any of these apart, have two quality English ones would this style offer better service with clamping nut acting as friction either via bellevilles or compression spring. Thank you for stedicam link. They are interesting. I'm not too interested the arm/gimbal/mass system. But iso-elastic arm systems are interestin, because, much of them are parallel linkage types, some have spring/pulley system to keep spring on constant force area. For me minimizing friction and maximizing constant force is not very relevant. Constant force is nice, some friction desirable. Magnetic stand stype is not one I have considered. Have you build one? Wire, rod or hydraulic lock type? I tested the "new" 150 N gas strut, based on yesterdays calculations it is either on goldilocks or slightly marginal = needs testing. I desiced to use the U-shape cable guard as a top arm. Looksed perfect and I drilled holes on other end - dang! not only askew close to 1 mm, but also way too far up to make it work, It would fit just outside the 25 mm RHS upright pipe, but the U-section does not allow any pivot, therefore I mounted it temporary interleaved, not outside of the upright. Another blatant oversight was gas strut rod clevis pin palacement. I would not fit low eneough to give the full leverage. Any lower and it would interfere with lower arm or it's pin and if I would mount it on lowerr pin, I should open up a whole lot of the lover arm and then it would not be that stong structurally. I'm using bolts as a pins on this prototype, but they will be centreless ground stock on the final model. Pin load is always a issue to check on this sort of levers. One thing I learned from struts, they seem to have end cushion when mounted arse up. YouT says, that there is a little oil inside the cylinder. Some things screwed, some things learned. Good day, alhough very little of visible progress. I'm hesitant to go on cable/pulley road, have to draw choises.